After a smash-hit run at the 2017 Edinburgh Fringe Festival, hilarious new musical SIX comes to the West End in its professional debut. Spinning the well-known history of Henry VIII and his wives on its head, the story follows every wife and their fate; will they be divorced, beheaded or left to live? Transforming Tudor queens into pop princesses desperate for the mic, SIX sees the notorious Henry VIII’s six wives sing their way out of the history books and into the dazzling spotlight. Featuring a raucous score including “Ex Wives”, “Haus of Holbein” and “Don’t Lose Ur Head”, this play-come-pop-concert remixes hundreds of years of heartbreak into a single hour of sass, perfect for 21st century audiences. Originally starting life with the Cambridge University Musical Theatre Society, the show ran at the 2017 Edinburgh Fringe Festival, earning a nomination for Musical Theatre Review’s inaugural Best Musical Award. Attracting the attention of well-known theatrical producers Kenny Wax and Global Musicals, the show transfers to the West End to play limited performances. Casting includes Renée Lamb (9 to 5) as Catherine of Aragon, Christina Modestou (In the Heights, Urinetown) as Anne Boleyn, Natalie Paris (Billy Elliot, Sunday in the Park with George) as Jane Seymour, Genesis Lynea (The Wild Party) as Anne of Cleves, Aimie Atkinson (In the Heights, Dirty Dancing) as Katherine Howard and Izuka Hoyle (Working) as Catherine Parr. Directed by Lotte Wakeham, the production features choreography by Cressida Carré, musical direction by Joe Beighton and orchestrations by Tom Curran. Creative team also includes sound designer Andy Graham, lighting designer Rebecca Fry and costume designer Roberto Surace. SIX is created by Toby Marlow and Lucy Moss, who met at university. 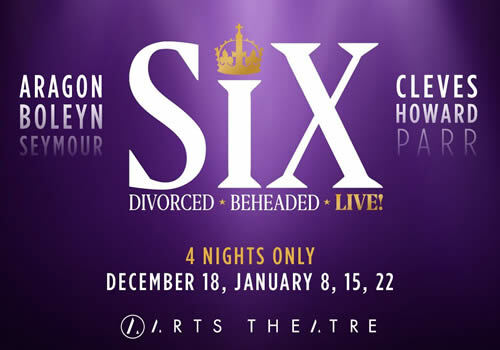 In January 2017, the pair made their first foray into playwrighting, producing the musical SIX. The two also are two-thirds of award-winning theatre company Hot Gay Time Machine, whose show ran to huge success at the Fringe Festival and played a sold-out season at Andrew Lloyd Webber’s The Other Palace. Playing a strictly limited four performances at the Arts Theatre, SIX is the hilariously irreverent musical that is guaranteed to have audiences rolling around in their seats. The production plays Monday performances on December 18th 2018 and January 8th, 15th and 22nd 2018. SIX is recommended for those aged 12 and up.